Have you ever come across a book that makes so much sense, you just know that you have to buy it and share it with those you love? I found this book and was immediately taken by not only its title, but also by the person who wrote it. Col. Chris Hadfield was being interviewed after his return to earth from a six month engagement on the International Space Station, as the Commander of the Space Station. During his interview, I could sense a deep love of the earth and of everything to be learnt in space too. Col. Hadfield has a simple but beautiful way of making you present with him as he explored the world and space around him. He is simple to read, but extraordinary in his insights and his love of the sciences that made it possible for him to leave the earth for 6 months and live in a very inhospitable environment, only to come back to earth and recount all of the wonders that he was blessed to see. Now don’t get me wrong, his book is really not that much about space and what he has seen as an astronaut, rather it is the story of a boy, who was infected with a taste for what he wanted to do in his life. That taste for his future came with the first steps of Neil Armstrong on July 20th of 1969. The moon, until that day, was somewhere that man had only dreamt of landing on. Around the world people were glued to their television sets and their wonder was also kindled! But for Chris Hadfield, it became his life’s mission to do everything possible to become an astronaut. 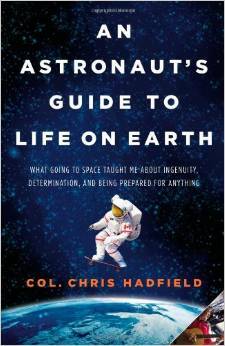 “An Astronaut’s Guide to Life on Earth” is a great book for those who are in the young teen age group and beyond. It is easy to read and to become totally engaged with the writer. To see how something like a walk on the moon, can change the very life of a young boy! It does sound like an excellent book. You can picture the mind of a child seeing that moon walk. The wonder of it that would inspire a lifetime! Adding to my list. Thanks for the great review.